This entry was posted in Racing on March 15, 2011 by Steve Tilford. 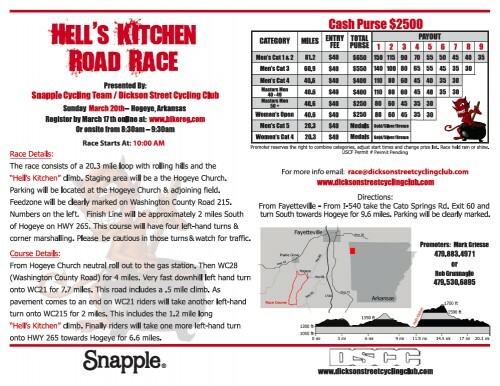 The Hell’s Kitchen Road Race is this Sunday outside Fayetteville Arkansas. Here’s a link to online registration at Bikereg.com. If you’re looking for somewhere fun to go ride a bike, this is it. The course is great with one long, steep climb and a few other rollers. The is in the same area as the Hogeye Road Race from Joe Martin NRC event. The weather is supposed to be in the 70’s on the weekend. I’ve won the race a couple times and they give out pitch forks to the winner’s. Nothing better than that! Click twice on the flyer to enlarge. Gonna use these this week to plant my garden. Wow. You are accomplished. You must have really gone through a lot to be able to win Women’s Open there. I try to win as many tools as possible at each event. I find it easier to win the women’s race than the PRO-1/2. 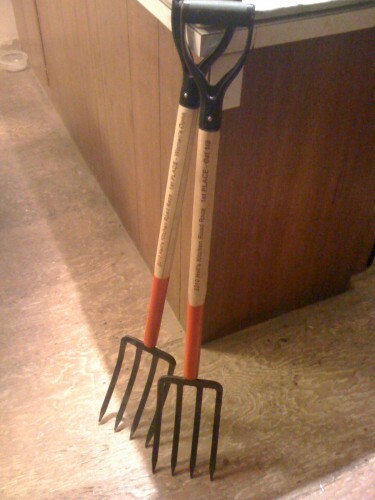 I do have two of the pitch forks. The 2nd one in the picture is Catherine Walberg’s from the previous year.